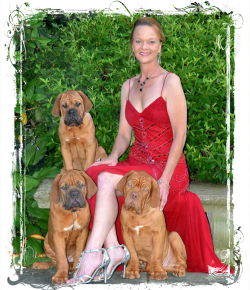 A few stories about us and our Dogues, including Claire’s appearance in the New York Times at the 2014 Westminster Kennel Club show. Whether Champion, pet or rescue, our dogs are, first and foremost, family members. They live in our home, sleep in our bed, and lounge on the furniture. We feel proper socialization is imperative to the well-rounded Bordeaux and they go most everywhere with us; the office, Home Depot, outdoor cafes and restaurants. We do not sell to breeders, desiring to keep our lines private and exclusive, and welcome applications from top-tier pet homes. We concentrate in one breed and one breed only.